END VIEW 8-CYLINDER ENGINE While it has only been a few years since the 8-cylinder car made its first appearance on the market, it is phenomenal the wide distribution they have gained, especially among the medium and higher priced cars. 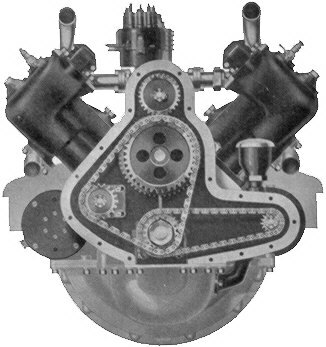 When you come to my school you will have ample opportunity to receive thorough training on the 8-cylinder or "V" type engines, mounted on block. In addition to this you will find a number of cars in my big repair shop which have the famous 8-cyllinder engines. There is one thing that I make it an absolute rule not to do, and that is to buy exhibition automobiles or machinery. Every engine and car that you find in my immense equipment is for your use while here at this school and for your instruction. When I obtain a new type of engine or equipment, I put it in my big demonstration rooms where all of my students have an opportunity to become thoroughly familiar with it. No automobile repairman or automobile mechanic can consider himself qualified unless he understands in a practical way not only the construction, but how to repair, operate and in every way handle the 8-cylinder cars. Few of my students realize until they come here that there is just as much difference in details of construction between the various types of motors as there are between makes of cars. One of the important features of my method of training is that I endeavor to provide every piece of equipment possible so that when you go out to fill a position in a garage or open and manage a business of your own, you know how to handle any piece of work you encounter, because you have done the same kind of work in my school. I can not emphasize too strongly how important this is to you. To sum it up, it means the difference between theory and practice. you could not be expected to remember, just from attending lectures and being told, the many things that are necessary to learn about motor cars and their construction, unless you had every opportunity to do the actual work itself, time and again. This is the kind of instruction you receive when you come to my school for training.